Summer Skincare Tips For Naturally Beautiful Skin. - Amphora Aromatics Ltd – Supplier of pure essential oils and aromatherapy Products. to help prevent sun damage. Skin can absorb the sun’s rays through glass too, so don’t think just because you’re in the car or bus you are protected. Slap on the sunscreen or sun block in the morning and apply even if it looks overcast. Keep skin hydrated – drinking at least two litres of clean water a day can help prevent skin from drying out – also helping skin cell formation as well as to cleanse the body of toxins. Start the day with a slice of lemon in a mug of warm water to hydrate the body and boost the digestive system. Moisturise to restore - a moisturising natural facial moisturiser, applied twice daily will also help keep skin hydrated and instantly improve the look and feel of dry skin. Try AA Skincare’s Lavender & Teatree Moisturising Face Lotion – calming and cooling on sunny days to help protect and heal skin. Great for oily skin and breakouts too. Feed skin antioxidants – to naturally protect skin from damaging ultraviolet rays increase antioxidant rich food in your diet. Eat plenty of vegetables such as Vitamin A-rich carrots and tomatoes as well as Vitamin C-rich berries and fruits – tomatoes and watermelons also help keep skin hydrated too. Exercise to boost skin health – for beautiful summer skin, make exercise part of your beauty routine. Dry skin will thank you for the boost - exercise promotes blood flow, helping to nourish blood cells and improve circulation, giving skin a healthy glow and a fresher, younger appearance. A good workout, a walk or a pilates session can also help reduce stress and give you a good night’s sleep – all helping to keep skin looking good. 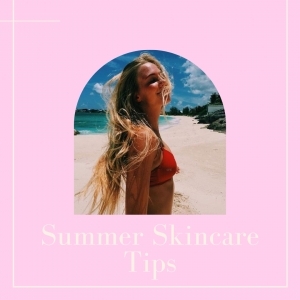 Keep skin clean – skipping your skincare routine before bed can wreak havoc on sun dried skin, drying it out further and giving you spots, blocked and enlarged pores as well as making eyelashes brittle. Also, you’ll be taking all the dirt from the day to bed with you - particles from pollution, dust and smoke cling to your skin - a recipe for spots and irritated skin. Treat skin to a spa treatment – create a spa experience at home with a weekly beauty-boosting facial to restore summer skin. Our vegan-friendly, intensely hydrating Mint & Dead Sea Salt Deep Cleansing Face Mask is the perfect skin detox and made from pure essential oils and naturally enriched with dead sea salts, natural clays, vitamins and minerals to draw out impurities, moisturise and tone skin. Leaving skin clean, balanced and hydrated.